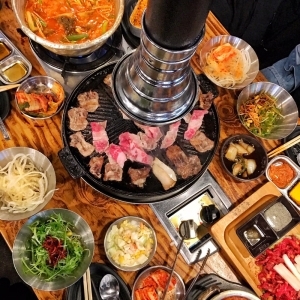 Based on our Restaurant Delight Index (RDI), the three best Korean BBQ restaurants in New York City in ranking order are: Jongro BBQ, Dons Bogam BBQ Wine & Bar, and Kang Ho Dong Baekjeong. Before I begin, I want to applaud 👏 Jongro BBQ for delivering the most delightful Korean BBQ experience in New York City. That ain’t easy! First of all, the rent is too damn high. Renting a restaurant space in NYC can be nearly double that of LA or San Francisco. Second, it’s frighteningly competitive. If your food isn’t up to New Yorkers’ high standards, good luck making it. However, not only does Jongro make the cut, it’s the king of our list. I’m personally a fan of authentic designs and atmosphere when trying new ethnic cuisine compared to modern clean interiors. Eating at Jongro transports you back to that old-timey Korean feel that provides a more traditional experience. 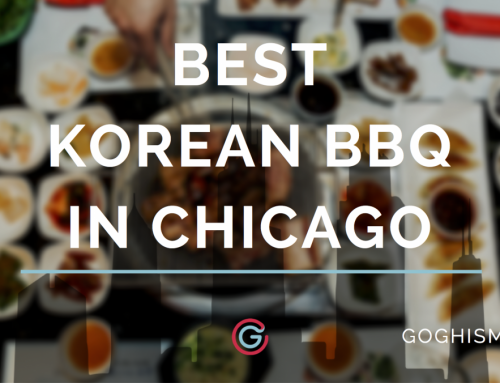 The most consistent positive review of Jongro BBQ is the the top notch quality of the meat. I’m confident that the overwhelming majority of Korean BBQ restaurants in the US use average quality meat and honestly who can blame them given the cost of everything nowadays. However, Jongro BBQ does it right which is clearly apparent when looking at the marbling on their beef. Something I’ve also never witnessed before Jongro is the stove adjacent to the grill. Often times when I’m at a Korean BBQ restaurant, I’m so focused on grilling the meats and veggies that I forget about the Korean stews and steamed eggs (계란찜) until they get cold. No worries here because the additional stove lets you keep these side dishes piping hot. Game changer! Customers noticed that they don’t serve as many side dishes as you would expect compared to other Korean BBQ restaurants, but you’re really coming here for the meat, a little less banchan won’t change that. Servers can also help you with grilling especially if you’re a first timer. However, customers pointed out that it can get extremely busy causing service to suffer a bit. It might be better to go during off peak hours if you want to avoid potentially slower service and a long wait. Even if you get stuck with a wait, be patient and stay, it’s worth it. When a disproportionate number of customers come out happy even after a long wait, you know you’ve got something irresistible. Give it up to Don’s for providing the second best Korean BBQ experience in New York City! You get what you pay for here. It’s a bit pricier than average but you get better quality meat in return. One reason they scored lower than Jongro on the RDI was that most reviewers commented that they enjoy grilling meat on their own, which is not an option at Don’s. I’m personally more biased towards grilling it myself as well as there’s this sense of reward when you can control the experience and perfectly cook to meat to your table’s taste. In addition, the seating can be pretty awkward, especially for people in the US not accustomed to sitting on the floor. Although it’s a traditional way of eating Korean food, not everyone enjoys sitting cross-legged. What makes this awkward is you’re seated a lot lower than the servers giving the impression that they’re standing over you as they grill the Korean BBQ. With that being said, you’re eating here to satisfy your meat cravings! Customers frequently commented on how great the cuts of meat were and described them as tender and juicy with very little fat. 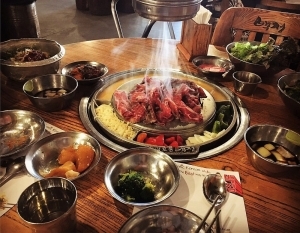 It’s an all-around high-quality Korean BBQ restaurant not just because of their decor like some restaurants but because of the meat and their service. Their atmosphere is a bonus. Although it gets busy, it doesn’t feel overcrowded. Oh and you won’t smell of smoke and meat when you leave because their ventilation game is on point. 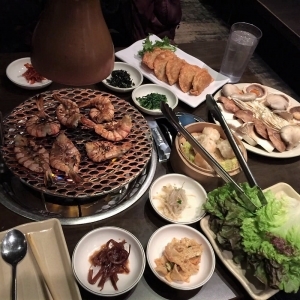 Dons Bogam BBQ & Wine Bar is truly a delicious and unique experience for first-timers and will thrill KBBQ veterans. 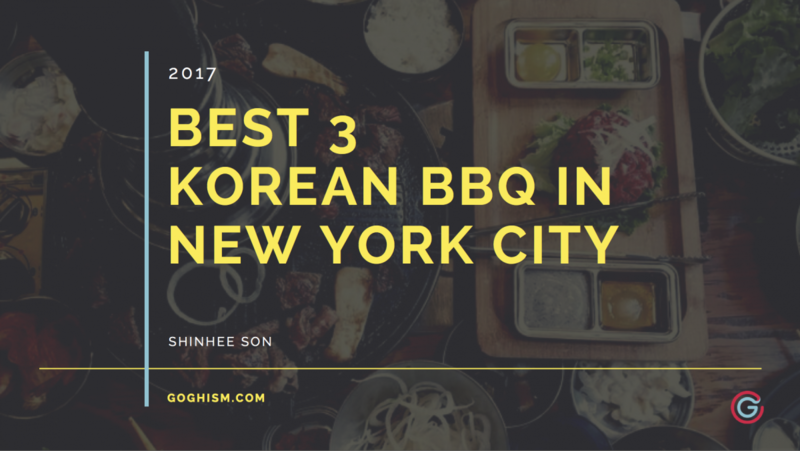 Coming in at #3, Kang Ho Dong takes the last remaining spot for best Korean BBQ restaurants in NYC. I absolutely love grill tops that have compartments for other ingredients like cheese! That’s such an underutilized and underrated ingredient for Korean BBQ. It’s a shame really! The quality of meat is high, but not on par as the first two reviewed. However, you’ll still enjoy it :). Their marinade game is strong and they don’t cut corners with their pork belly bringing out thick, juicy slabs; no paper thin sangyupsal here. What’s nice is the attention they pay to the overall Korean BBQ experience; they will bring out the different cuts of meat in a certain order aimed at providing the most flavorful meal they can (think of a great omakase but with slabs of meat instead of fish). The service is not consistently good, but it won’t ruin your time. Some customers mentioned how the service varied each time they went. However, what makes this spot better than those downtown is the shorter wait and more space for parking. If you want, there’s a bus stop that will drop you off right in front of the restaurant. Just like Dons Bogam, the servers cook the food for you, which again I’m not partial to but you may enjoy it. If you’re craving Korean BBQ and in the Queens area or don’t want to deal with the craziness of NYC, come here. You’ll get your fix and more. The main goal of this post is to cut through all the noise and give you the most likely answer to the question, “Where can I get the best Korean BBQ in New York City?”. We all know “best” is highly subjective. Tastes vary, what we look for in a dining experience differ, rating scales are all over the place. You would also be hard-pressed to find someone that’s actually been to every Korean BBQ restaurant, let alone be able to compare and contrast them all objectively. So — I have spent hours in my underground lab, playing with algorithms and Tony Stark tech and created the Restaraunt Delight Index (RDI) to arrive at a more confident answer for us all. Two principles behind the RDI: Delight and the Law of Large Numbers. Does have a grill your own component. You can read more about the Law of Large Numbers here and a shorter description in my best Korean restaurants in every state post but the tl;dr as it relates to restaurants is that the more opinions there are, the more likely the average of those opinions are true. Therefore, we decided to use Yelp as it undeniably has the largest activity and available data set of crowd-sourced reviews. It’s also the ubiquitous resource for researching a restaurant. Google and Tripadvisor simply don’t have enough reviews; bigger is better.